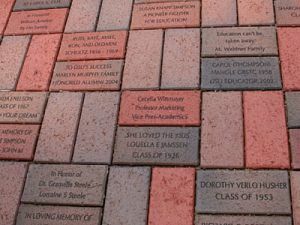 Personalized Paver Bricks - memorialize a loved one for posterity. We are at the beginning of the refurbishment of the Hawthorne Station. The move 75′ back from the corner was funded by our recent projects. To complete the job and see the exterior of the building returned to its former glory, we need to do more fundraising. By purchasing pavers you will be enhancing the future of a building that has seen so much of the past and has many stories to tell generations to come. The paver bricks will be part of the walking path that leads from Diamond Bridge Avenue to the station. 1) Download the VRA Paver Order Form. 2) Fill it out and then save it. 4) Attach the com­pleted VRA Paver Order Form to the email and click send. * $5 will be donated to the corresponding organization when you chose their logo! Remember that the VRA is a 501(c)(3) non-profit organization, the purchase of pavers can even get you a tax write off!